A suspected unexploded tank shell found in woodland was detonated at a golf course. 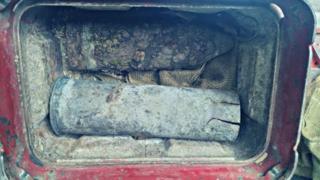 The 18lb piece of ordnance was discovered near Mill Lane in Cookham, Berkshire, on Sunday at 14:00 GMT. A Royal Logistic Corps bomb disposal team took it to nearby Maidenhead Golf Club, where a controlled explosion took place in a bunker. Thames Valley Police said analysis later revealed the round had been "a solid lump and not live". On Twitter, the force said: "Our thanks to Maidenhead Golf Course who kindly agreed to stage the controlled explosion in one of their bunkers."